On a narrow back street in downtown Kyoto, away from milling crowds and hubbub is a restaurant offering intimacy, authenticity, and delicious seafood. Kyoto-ites are notoriously secretive about telling people from outside of their city about favorite dining spots. Sushidokoro Man is one well-kept secret, and it is here that you can discover superb food and take in the local atmosphere. In its new location a mere eight months, Sushidokoro Man from the outside looks Scandinavian in design. Blond wood, glass, simple lines of design that are inviting and minimal. Inside, it is much the same, with nine counter seats only and 26 table seats. Chef Akira Umehara (MAN-san), in his white cap and white chef’s clothing, has a large, open face, big ears, and very expressive eyes. His enormous hands and very thick wrists move with dexterity as he slices the fish. He has been a sushi master for over forty years, and works here, as the owner the past thirteen years, with his wife and son. “I go to the market to buy fish daily. And one guy calls me from his boat to sell me the best,” he explains merrily. His love of the work is communicated in the freshness of his food. Which tastes as if it was swimming in the ocean that morning. True to Kyoto-style, Mr. Umehara serves his fish grilled and fried in some courses as well as raw. 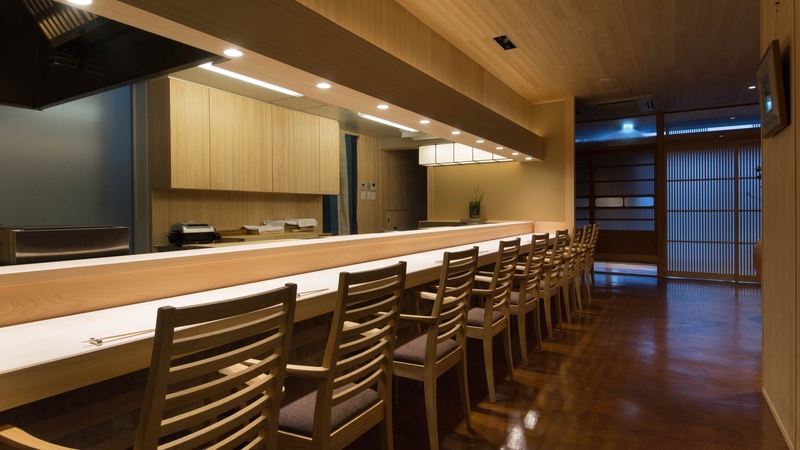 You can have omakase (let the chef choose) or a la carte. The menu is deeply seasonal, and one night you may have uni (sea urchin) served in its shell, sashimi of shimaji (striped skipjack) and maguro toro (tuna belly), ika (squid), fried fugu (blowfish) collar, steamed anago (sea eel), and grilled unagi(river eel) in a pot of rice. Portions are perfect with small bites providing enough room for guests to enjoy an evening of multiple courses. European wines and first-rate sake from all over Japan, well-paired with the food, add a lot. Please wait until receiving our email confirming your reservation. © Sushiman. All rights reserved. Website produced by FALEME Jonathan.